As a young man, Georges Doriot dreamed of running a factory, a rare aspirational failure in his long, storied career. 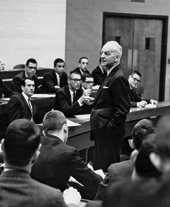 Rather, he ended up teaching thousands of HBS students how they should run modern enterprises, masterminded U.S. Army research and development during World War II, spearheaded the construction of an HBS-like business school in France (INSEAD), and, perhaps most notably, launched the modern venture capital industry. 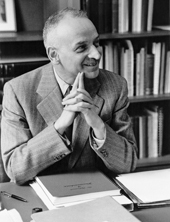 His remarkable life is the subject of a new biography, Creative Capital: Georges Doriot and the Birth of Venture Capital (HBS Press, 2008), by BusinessWeek editor Spencer E. Ante. What follows is an excerpt adapted from the book. Venture capital has existed in one form or another since the earliest days of commercial activity. The Spanish monarchy and Italian investors who financed the transatlantic voyage of Christopher Columbus were, in a sense, venture capitalists. But it wasn’t until the second half of the 20th century that venture financing became a professional, large-scale industry. And the man who led that transformation was Georges Doriot. I can’t recall exactly when I first came across the name of General Georges Frederic Doriot, but I do know that in 2002, when I looked into the sparse literature on the history of venture capital, his name kept popping up. I found a bunch of newspaper and magazine profiles, a chapter on him in a book or two, and a short film, but no full-length biography. The venture capital industry began to take shape after World War II on the northeastern seaboard when in 1946 Doriot became president of the first public venture capital firm: Boston-based American Research and Development Corporation (ARD). The famous inventor Charles F. Kettering (MBA ’27) predicted ARD would go bust in five years. But Doriot proved him wrong over the next 25 years, as his firm financed and nurtured more than 100 start-ups, many of which became huge successes that pushed the frontiers of technology and business. ARD companies led the way in developing computers, atom smashers, medical devices, and new machines that desalinated brackish water. Doriot even backed George H.W. Bush’s first company, Zapata Off-Shore Company. “He was very important because he was the first one to believe there was a future in financing entrepreneurs in an organized way,” says Arnold Kroll, an investment banker at Lehman Brothers who worked with ARD. Doriot was not a physically imposing fellow, but he exuded a magnetic aura. “It was almost like knowing someone like Beethoven or Einstein,” says Charles Dyer (MBA ’67), a former pilot for Eastern Airlines who became close to Doriot in the General’s later years. A wiry man with ramrod posture, Doriot was about 5’10”, with a thin moustache, elegant bearing, and piercing blue eyes. He spoke with a charming French accent that some associates referred to as the “velvet glove.” Always impeccably turned out in a suit and tie, he required all of his students in his class at HBS to dress accordingly. “Sport coats are for newspaper boys and college boys,” he would chide his pupils. The more I researched Doriot’s life, my fascination with an idea transformed into a fascination with the man behind the idea. Doriot was one of the most charismatic characters I had ever come across. Although I had never met the man, I fell under his spell. Born on September 24, 1899, in Paris, Doriot was the son of an engineer who helped build one of the first automobiles for the firm now known as the Peugeot Motor Company. When I visited Doriot’s surviving relatives in Paris, I learned that Doriot’s father, Auguste, was also an entrepreneur himself who, in the early 20th century, launched Doriot, Flandrin, Parant, an innovative car company. 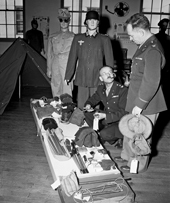 Doriot, examining enemy gear, served as head of R&D in the Office of the Quartermaster General during World War II, rising to brigadier general. Doriot was one of the century’s most visionary thinkers. He was early to recognize the importance of globalization and creativity in the business world. And decades before economists appreciated the value of technology, Doriot realized that innovation was the key to economic progress. “A lot of the things that were attributed to Peter Drucker were Doriot’s ideas,” says Charles P. Waite (MBA ’59), a former student who went on to work at ARD for many years and was a founding partner of Greylock, the Boston-based venture capital firm. In his classes, Doriot often spoke about the railroads, air-conditioning, and air travel, and how those technologies opened up new worlds and increased the productivity of business. “The General’s view of the world as one of constant competition, led to his belief that innovation — continuous innovation, never relaxing — was the only way to stay ahead of the competition,” says Robert A. McCabe (MBA ’58), a close friend and former investment banker at Lehman Brothers. During World War II, Doriot played a critical role in the Allied victory — and learned how to become a venture capitalist. As head of research and development in the Office of the Quartermaster General, Doriot led a revolution in the military by applying science to the art of war. Under his command, the U.S. Army found substitutes for critical raw materials, and developed dozens of innovative items such as water-repellent fabrics, cold weather shoes and uniforms, sunscreen, insecticides, and nutritious compact food, including the infamous K rations. In one confidential project, Doriot oversaw the invention of Doron, lightweight plastic armor that was named in his honor. For his achievements, Doriot was promoted to the rank of brigadier general and received the Distinguished Service Medal, the highest U.S. military medal given to a noncombatant, as well as being decorated a Commander of the British Empire and awarded the French Legion of Honor. Doriot’s wartime experience proved his exceptional talent: He was not only a visionary but also a man of action, someone who had the energy, discipline, and charisma to bring his big ideas to fruition. Indeed, during the postwar period, Doriot went on to found a number of important institutions. In 1954, his vision of a peacetime research organization for American GIs was born with the opening of the U.S. Army Soldier Systems Center in Natick, Massachusetts, a research lab dedicated for the last sixty years to providing America’s soldiers with the world’s best equipment. In 1957, his dream of a European business school came to life with the Institut Européen d’Administration des Affaires (INSEAD), today’s leading European business school. Scaling each of these peaks, Doriot bucked the prevailing system. Although he helped implement HBS’s famous case study method early in his teaching career, after the war Doriot transcended this approach. Instead he lectured students with his philosophy of business and life, and gave them practical experience by sending them on consulting assignments with real companies. In the military, he ruffled feathers by resisting orders so he could make sure soldiers had the equipment they needed to survive in the trenches. And in the financial world, he upset the conventional wisdom by proving that there was big money to be made from patient investing in and the nurturing of small, unproven companies. In hindsight, it is Doriot’s work running ARD that truly distinguishes him as a 20th-century giant. In 1946, Doriot was recruited to run ARD by a cadre of New England elites — Massachusetts Investors Trust chairman Merrill Griswold, MIT president Karl T. Compton, and Vermont Senator Ralph E. Flanders, the first Congressman to publicly upbraid Joseph McCarthy. Fresh from the U.S. victory in World War II, these luminaries conceived ARD as a vehicle to revive New England and the U.S. economy. In their minds, ARD would solve a major imperfection of modern U.S. capitalism: New companies were starved for money and professional management. It’s hard to imagine these days, with billions of dollars swimming around the globe, but after the war, entrepreneurs had a difficult, if not impossible, time raising capital. Banks were ultraconservative, reluctant to lend money to unproven ventures. Sure, rich families like the Rockefellers invested in new companies, but they were few and hard to reach. ARD promised to break down the walls of an elitist, insular world, reviewing ideas from thousands of companies across the country. Doriot never graduated from college and dropped out of HBS after one year to take a job on Wall Street, but he became, arguably, the most influential and popular professor at the School. ARD’s beginnings were modest — its first venture fund was a mere $3.4 million. A few of its initial investments failed, and Doriot spent a lot of time in ARD’s early days responding to angry and impatient shareholders. But under the General’s leadership, ARD created the paradigm of entrepreneurial success. The dozens of prominent companies nurtured under ARD were the most obvious proof of Doriot’s achievements. Yet Doriot also exerted an influence through his writings, his speeches, and ARD’s annual meetings, in which its investment companies set up booths and enjoyed an opportunity to network and talk to potential investors. “He gave a dignity or a substance to the process, and that always attracts imitators,” says Lehman’s Kroll, who attended many ARD meetings over the years. In the late 1960s, Doriot’s influence persisted through the work of his disciples, as various ARD alumni founded and ran the second generation of successful VC firms, including Greylock Partners and Fidelity Ventures. One child, an ambitious little outfit called Digital Equipment Corporation, more than fulfilled its hopes, cementing the legend of ARD and Doriot. In 1957, ARD gave $70,000 to the two young MIT engineers who cofounded Digital — Kenneth P. Olsen and Harlan Anderson — in exchange for 70 percent of the start-up’s equity. Olsen, who was Digital’s president and undisputed leader, wanted to build smaller, cheaper, and easier-to-use computers that would challenge the glass-encased mainframes of IBM, the dominant computer manufacturer and the only one making money. Doriot did not act alone. His wife, Edna Allen, supported him every step of the way, allowing him to focus obsessively on his intellectual and commercial pursuits. A pretty, intelligent, and caring American woman, Edna was a research assistant at HBS when she first laid eyes on Doriot. For the next 48 years, Edna was his devoted wife and closest friend, and the couple enjoyed a lifelong storybook romance. Doriot would often write love poems about Edna. And the favor was returned. “When he went on a trip he’d find a love note in his pajamas,” says Olsen. Despite a somewhat tragic ending to his career (he died of lung cancer at age 87 on June 2, 1987), all of the strands of Doriot’s life connect to form something quite profound. In the second half of the 20th century, the United States experienced a historic transformation, in which a society dominated by large corporations such as Standard Oil, U.S. Steel, and General Motors morphed into a nation driven by small and nimble venture-backed start-ups such as Digital Equipment Corporation, Intel Corporation, Microsoft, Starbucks, and many others. Ever since, those small, innovative companies have created new markets and millions of high-paying jobs while also forcing old industries to become more efficient and productive. A recent study by the National Venture Capital Association found that U.S. venture-backed companies between 1970 and 2005 accounted for 10 million jobs and nearly 17 percent of the nation’s gross domestic product. Doriot was the prophet of this new “Start-up Nation,” the leader of a social and economic crusade that democratized the clubby world of finance. More than any other person, Doriot — through his teaching, writing, and leadership in the military, academic, and financial worlds — pioneered the transition to an economy built on entrepreneurship and innovation. For playing this role, Doriot should be revered as much as other well-known business titans such as J.P. Morgan, John D. Rockefeller, or Andrew Carnegie.